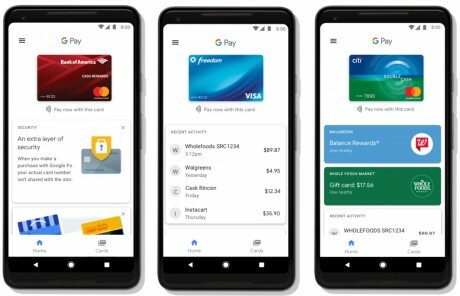 Google today released Google Pay, the revised payment application and service that replaces Android Pay. Google Pay encompasses most features of Google Wallet and Android Pay in a single app, allowing people to use Google Pay to make payments online and via mobile devices. Google Pay is already accepted on some apps and web sites, including Airbnb, Dice, Fandango, HungryHouse, and Instacart. Google expects Google Pay to become more widely available online quickly, as developers don't have to do much to alter their existing Google Wallet- and Android Pay-backed services for full Google Pay integration. Google Pay for Android features information about nearby stores, recent purchases, and access to rewards. A new tab helps users collect and organize their loyalty and membership cards. Google Pay supports mass transit payments in Kiev, London, and Portland, with more cities coming soon. The Google Wallet app is being rebranded to Google Pay Send and will soon allow people in the U.S. and U.K. to send/request money to/from their peers. Google Pay is available from the Google Play Store.